According to "The Benefits of Running," which is a paper written by Elizabeth McLeod Sadler of Vanderbilt University, there are a number of benefits associated with running, including drops in blood pressure and body weight, and increases in lung capacity. While the types of equipment needed by runners is relatively limited, a good pair of running shoes is a must. Running shoes not only provide substantial midsole foot cushioning, they also offer arch support, aid in the prevention of injuries and can promote improved athletic performance. Arch support is a must for individuals with flat feet -- especially if they participate in a regular exercise routine. It is no surprise, then, that the arch support provided by most running shoes is a major benefit for most avid exercisers. The American College of Sports Medicine suggests that runners with flat feet consult a physical therapist or exercise physiologist for recommendations on the best running shoes. While flat-footed runners may experience the greatest benefit from the arch stability found in most running shoes, even those with high arches can benefit from the right kind of support. 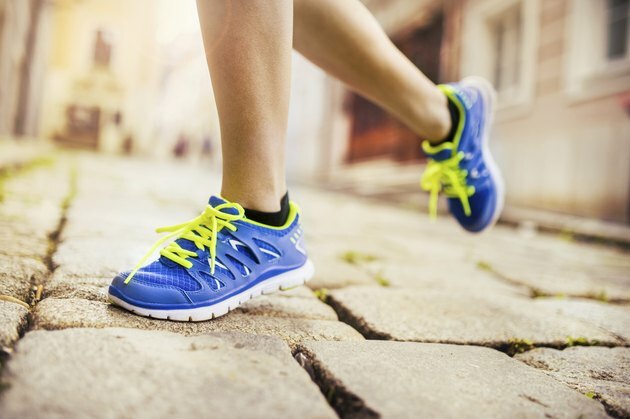 In many cases, running shoes can help prevent certain types of injury. In fact, the American College of Sports Medicine suggests that the midsole cushioning and arch support described above can prevent overuse injuries, such as tendonitis, stress fractures and joint pain. Though barefoot running -- in which exercisers run without the protection of any foot covering -- has increased in popularity over the past few years, the risk for cuts and scrapes is high. The American Council on Exercise reports that the outsole protection offered by the shoes reduces injury to the feet.